When dog owners go on holiday, they understandably want to take their dog with them, it saves money on kennels and they’re part of the family, why shouldn’t they get a holiday too? 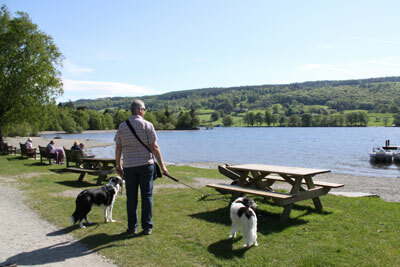 The Lake District is one of the more popular places to go for a pet friendly holiday because of the great choice of walks, around the lakes or into the hills and mountains. Even the pubs and tea shops in Cumbria are ready for visitors with their dogs and provide welcome bowls of water for their canine clients. The other great factor that makes Cumbria and the Lake District attractive to dog owners is the huge number of holiday cottages and apartments where dogs are allowed to stay. Enjoy each day of your holiday with a dog freindly outing. Allow the dogs to swim in the shallow waters of some of the lakes and to accompany you as you explore the hills of the Lakelands. We do not know whether dogs appreciate scenery as much as people, however, it is guaranteed that they will discover hundreds of new fascinating scents to make their lives more interesting.